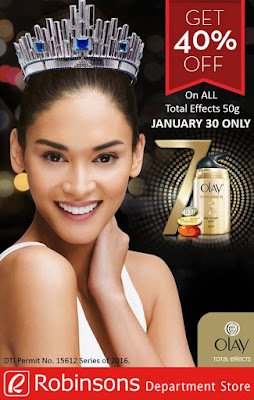 On the last weekend of her reign, get Queen Pia’s choice, Olay Total Effects! Get the secret to every beauty queen's soft skin, and get it at 40% off! EXCLUSIVELY available at Robinsons Department Store on January 30, 2017! Head over to Robinsons Department Store and get the Total Effects 50g at 40% off! This promo runs for one day only - January 30, 2017, so don't miss out!